New, Amino Acid Powerhouse. SizeOn Maximum Performance. The Ultimate Mass Monster. Hybrid Intra-Workout Whey Hydrolysate Creatine Formula with Outlast Carbohydrate Matrix. 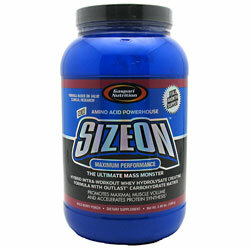 Promotes Maximal Muscle Volume and Accelerates Protein Synthesis. Dietary Supplement. Formula Based on Valid Clinical Research. Dramatic Results. Full Month Supply. There is Zero Doubt Size On Will: Accelerate Protein Synthesis & Muscle Force Recovery; Increase Muscle Volume, Muscle Fiber Size, Cell Volume & Plasma Amino Acid Levels; Amplify S6K1 and 4E-BP1 Signaling and Hypertrophic mTOR Pathway Conductio; Initiate & Sustain Myogenensis and Muscle Recovery While You Are Still Training; Deliver Vital Nutrients, Essential Minerals, and Growth Cofactors To Skeletal Muscle Tissue; Harness the Insulintrophic and Anabolic Power of Pterostilbene. Gaspari Nutrition took Sports Nutrition to the highest level with the original SizeOn, the original intra-workout creatine drink. There wasn\'t any doubt it represented a serious innovative leap forward in the creatine category. The original SizeOn formula clearly demonstrated its effectiveness in a clinical setting and quickly became known as the King of Creatines. As clinical research advances, so does Gaspari Nutrition which is why SizeOn has now evolved into the Ultimate Hybrid Intra-Workout Whey Hydrolysate Creatine Formula. Once again Gaspari Nutrition raises the bar even higher in the sports nutrition Industry. Your body requires that proteins from whole food, whey isolate, casein, etc., be broken down in a process called hydrolyzation. This is an integral process which allows di and tripeptides to be absorbed and utilized for numerous processes including muscle building and repair. The problem is that while your muscles are starving for these nutrients (i.e. during exercise) your body must digest them into smaller peptides. Research has shown that these are absorbed even faster than free form amino acids. For this reason Gaspari Nutrition uses a high quality whey hydrolysate that contains over 50% di and tripeptides as well as a large array of anabolic promoting ingredients such as a high dose of L-Leucine (5 grams) to allow for unparalleled increases in athletic performance, skeletal muscle recovery, explosiveness and most notably, immediate increases in muscle size While You Are Still Training. Furthermore Gaspari Nutrition researchers have harnessed the power of pterostilbene which is our patent pending and brand new insulinogenic secretegogue picked specifically to work in concert with our famed and patent pending Outlast carbohydrate blend. Outlast is a patent pending blend of three complex sugar molecules that lasts up to 5X longer than plain maltodextrin. This powerful combination initiates and sustains muscle volumization and anabolism to levels never seen before in a sports nutrition product. Pterostilbene, is milligram per milligram, by far the most powerful insulinotropic compound ever utilized in a dietary supplement. To top it off, we also included Lola, our cutting-edge, ammonia scavenging amino acid salt of L-Ornithine and L-Aspartate to help battle fatigue. The bottom line is that Gaspari Nutrition has once again outdone itself and yet again redefined the very category if created. Every single ingredient in SizeOn was selected specifically and solely for the scientific evidence to support efficacy and safety. You can be assured this product is formulated based on Valid scientific research and not overhyped nonsense which doesn\'t deliver the results you demand and pay for. Train Harder, Faster & Longer with SizeOn! (These statements have not been evaluated by the Food and Drug Administration. This product is not intended to diagnose, treat, cure or prevent any disease). SizeOn Proprietary Blend 61g: Outlast Insutropin Matrix: Palatinose (Isomaltulose), D-Glucose, Trehalose, Pterostilbene. Protein Synthesis Acceleration Matrix: Whey Protein Hydrolysate, L-Leucine (5g), L-Isoleucine, L-Valine, L-Ornithine-L-Aspartate. PhosphoDrive Endurance Complex: Creapure (Creatine Monohydrate), Creatine MagnaPower (Magnesium Creatine Chelate), Disodium Creatine Phosphate. OsmoDrive Advanced Hydration Complex: L-Taurine, Sodium Glycerophosphate, Calcium Glycerophosphate, Potassium Glycerophosphate, Sustamine (L-Alanyl-L-Glutamine), Magnesium Glycyl Glutamine. Malic Acid, Citric Acid, Natural and Artificial Flavors, Salt, Silica, Sucralose, FD&C Red No. 40, Acesulfame Potassium.